There are several trigger points that create pain in the ear. neuromuscular assessment can help to pinpoint the right one. 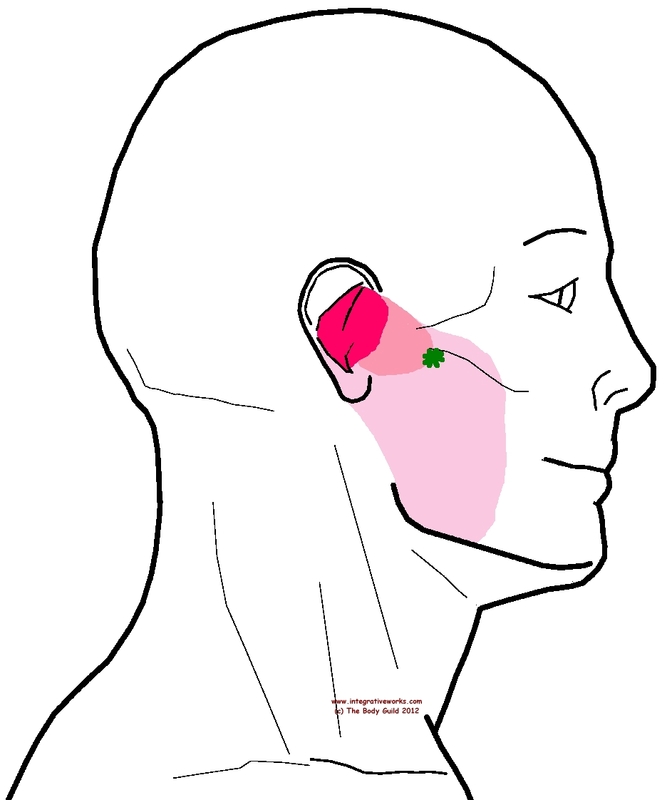 This referral point of trigger point focuses in the ear and spread through the jaw. This trigger point is a knot deep in the masseter of the jaw, just in front of the ear. People usually complain about an earache and some jaw tension. Sometimes they complain about a roaring in the ear or some other form of tinnitus. At times, when the trigger point is most severe, there is sharp pain deep in the ear with a sickly ache in the jaw. Usually clients don’t complain to their massage therapist about this kind of earache and jaw pain. Unless they know that trigger points cause earaches and that their massage therapist can help with that, they only complain about this as an incidental comment. They may even miss the session to seek antibiotics. This earache continues or recurs after the antibiotics finish. Clients may be savvy to their TMJ issue from previous treatment. They may also realize that they get more ear pain when they chew or stretch their jaw. Even though this trigger point doesn’t usually create restrictions when opening the jaw, it does create pain around to the TMJ. It often occurs with other TMJ trigger point patterns. I have seen this pattern linger after the client has extensive dentistry and antibiotics to address the ear and jaw pain. This, like other masseter trigger points, is usually activated by unusual jaw activity, like crunching ice, busting popcorn kernels, or chewing on toothpicks. A bad tooth can also cause a deviant chewing pattern that aggravates this trigger point. Nearby joint problems, especially a displaced atlas, are usually a part of perpetuating this pattern. A little ice and stretch on the jaw may produce temporary relief. Pressing on the trigger may produce relief but it is also easy to further aggravate it. This referral has similarities to the referral of sternocleidomastoid, rectus capitis anterior and longissimus capitis. Your neuromuscular therapist or craniostructural therapist is trained to sort that out and deal with the underlying problems to create lasting relief. The trigger points are in the belly of the masseter just behind the roots of the teeth. It usually feels knotted and sensitive. Pressing on this knotted muscle makes the sensation in the tooth and roots flare up with a little relief afterward. It is easy to aggravate the trigger point and the tooth infection this way. 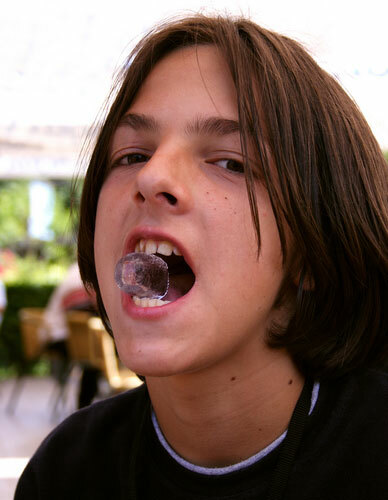 Try Ice and Stretch on your jaw and you’re more likely to get temporary relief. See your neuromuscular therapist or craniostructural therapist for lasting relief. This post is part of a series on trigger points that are connected with tooth pain. It is intended to help one to understand how tooth pain is generated by trigger points and how to relieve tooth pain by releasing trigger points. It is not intended to encourage anyone to avoid proper dental care. Even when the pain is generated by trigger points, the chemical irritants in the referral pattern impact the tooth and gums adversely and your teeth should be checked by a dentist. The trigger points are in the superficial masseter just below the zygomatic arch and make area around the tooth feel even more sore. Ice-n-stretch helps to relieve local tenderness and make it easier to work here. Masseter is thick and, pound for pound, one of the strongest muscles of the body. This is seldom released with lasting relief with direct work on the trigger points. Cranial work, upper cervical alignment and softer modalities like stretching and oral motor therapies make this work more tolerable to the client, easier on the therapist and support global changes that make for lasting relief.